After having spent six nights in Quito, the most I’ve spent in any pace so far, it’s fair to say I was very excited to be moving on to somewhere new. 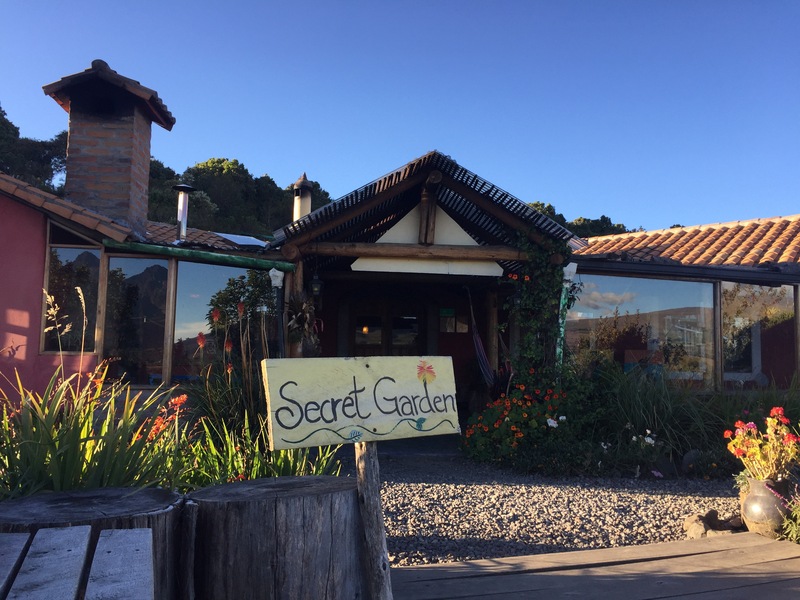 The hostel I had been staying at in Quito, The Secret Garden, has a sister hostel in Cotopaxi national park. Everyone I had met at the hostel seemed to be moving onto there next so I thought there must be a good reason for it. 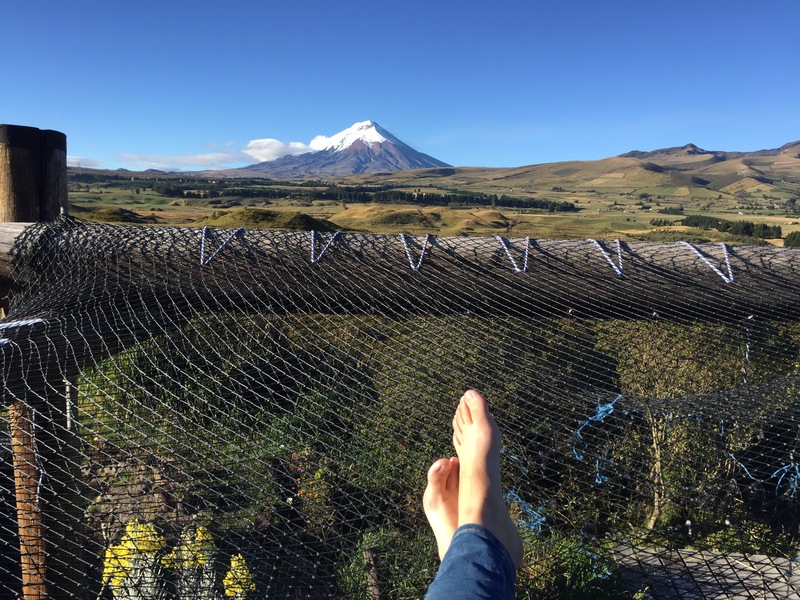 Cotopaxi is one of Ecuador’s most famous volcanoes and visiting it was already on my bucket list, so I joined the bandwagon and booked the 3 day-2 night inclusive trip ($88 for a dorm). We set off at a reasonable 10:30am to travel to the new hostel in a Jeep. The four-wheel drive was definitely necessary, the road was bumpy, cobbled in parts and full of holes to avoid. It reminded me of the driving in Venezuela. On the way there it was quite cloudy and I was always looking out the windows to try and get a glimpse of the snow-capped volcano. The hostel itself is enchanting. It’s run like clockwork and you are immediately welcomed into a warm and cosy lounge, with mulled wine at the ready. There are two long tables where everyone eats their meals together, a large round kitchen in the centre of the main room and a fire that gets lit in the evenings. 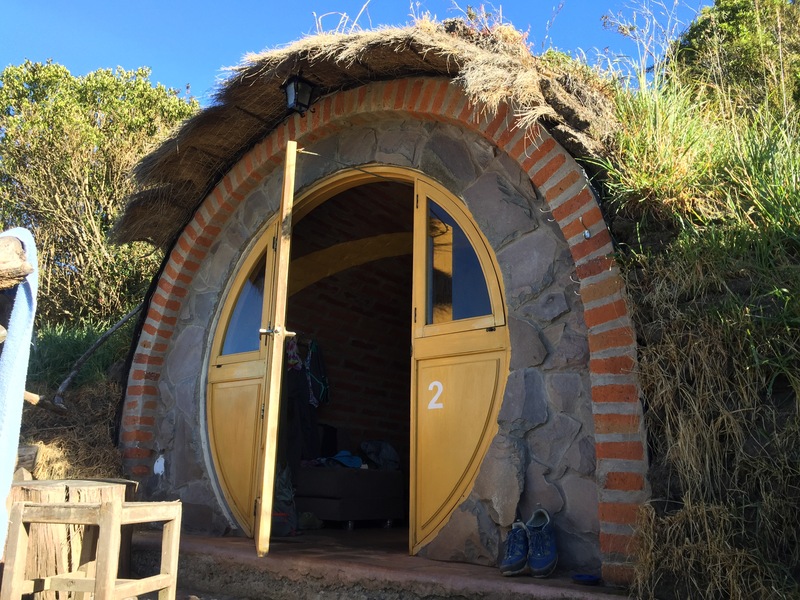 I realised once I had arrived that you could also stay in Hobbit holes (like in The Lord of the Rings & The Hobbit) but you have to be really organised as they get booked up very quickly. My dorm was great though, with its own log-burning fire and amazing views of Cotopaxi. 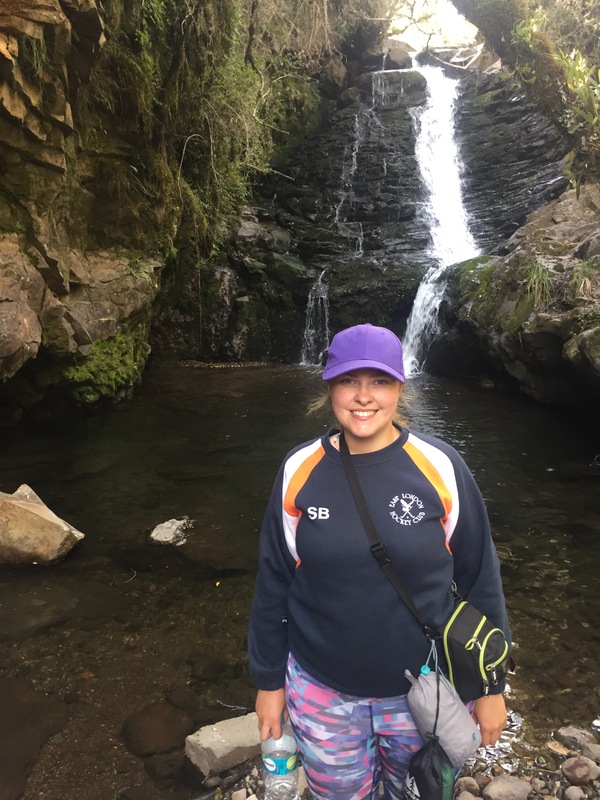 After a delicious lunch, our first activity was a short walk to some nearby waterfalls where we could jump in, if we felt brave enough. The walk lasted about an hour and it was a nice opportunity to get to know the people in my group who I would be spending the next few days with. I asked one of the volunteers what would be the best time for taking pictures of Cotopaxi, as it was still covered in clouds. She said you could never tell and it had been cloudy for a while, in fact some people never get to see it. Disappointed, I put this thought out of my mind and continued on with the walk. Feeling adventurous I decided to jump off the waterfall. I don’t have any proof but I can tell you it was very very cold. The platform was only about three metres tall but it was a wet and slippy. I was very nervous of not jumping far enough and hitting my head on the rocks. But I managed to jump cleanly and just about touch the pebble covered bottom of the pool before resurfacing and rushing out of the freezing water to change. By the time we got back from the waterfalls, we were greeted by the most amazing view of Cotopaxi, finally clear after what it turns out to have been two weeks of cloud curtains. I felt so extremely lucky to see this beautiful view so early and clearly in my stay. I went to relax and reheat in the jacuzzi which had panoramic views and ended up getting out every five minutes to take pictures. The first night was fajitas for dinner (one of my favourites) and then I sat up writing and reading by the fire, snuggled up with one of the five hostel dogs. When I left the main lodge to head to bed, I had a second truly amazing view – the most clear, starry night I have ever seen. The snowcapped mountains shone in the moonlight and I didn’t know which direction to look in there were so many stars, each as bright as the next. 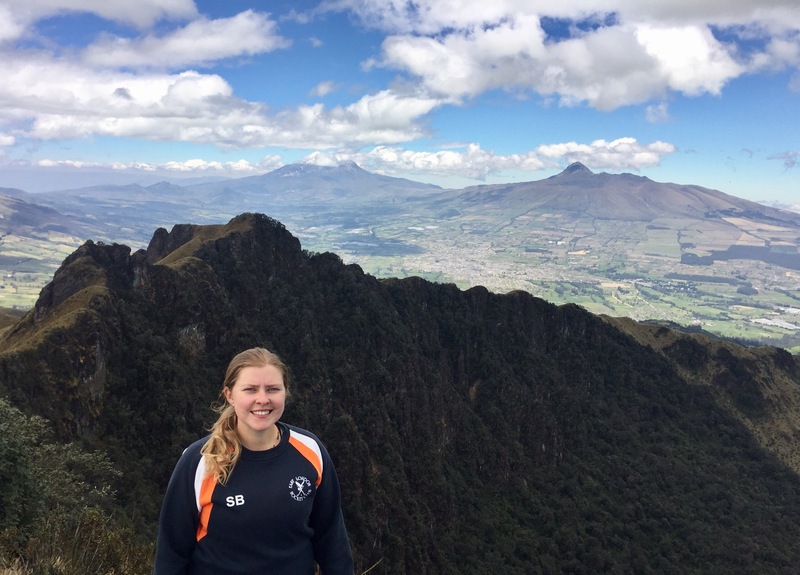 The next day we set off early on a six hour hike to the top of Pasochoa, a nearby extinct volcano (4,200 m). I found this day so tough and it was the first time in a week the altitude had seriously affected me. Every step made me more and more out of breath. I was desperate not to keep holding everyone up but I couldn’t move any faster. I’m not exactly fit at the moment but I have been walking a lot so I didn’t expect to find it so hard. By the time I finally reached the top I was tearful and shaky. The coca leaves I had near to the top had helped a bit but I still felt weak and surprised at how hard it was for me. The way down was much easier – in fact as points I was running and jumping. I wanted to show to myself that I’m not weak. But in hindsight, why does it matter if I am? It doesn’t matter if I’m not the best and one of the lesson I most want to learn from travelling is not to be so competitive with myself anymore. Being the best and being the worst doesn’t matter. It’s about being happy and enjoying the moment you’re in. I was exhausted by the time we got back and excited to hear it was pizza for dinner. I spent the rest of the evening in a similar way to the one before, relaxing, writing and reading. It struck me on the way back to my dorm, once again lucky enough to have a clear night, that this would be a place I would be happy to come to die. It sounds really morbid but the hostel and its surroundings felt so calm and relaxing. A dutch girl had described it as a ‘zen’ place to be and I agree with her. It felt like what I imagine a yoga retreat to be like, without the flexibility and stretchy pants. 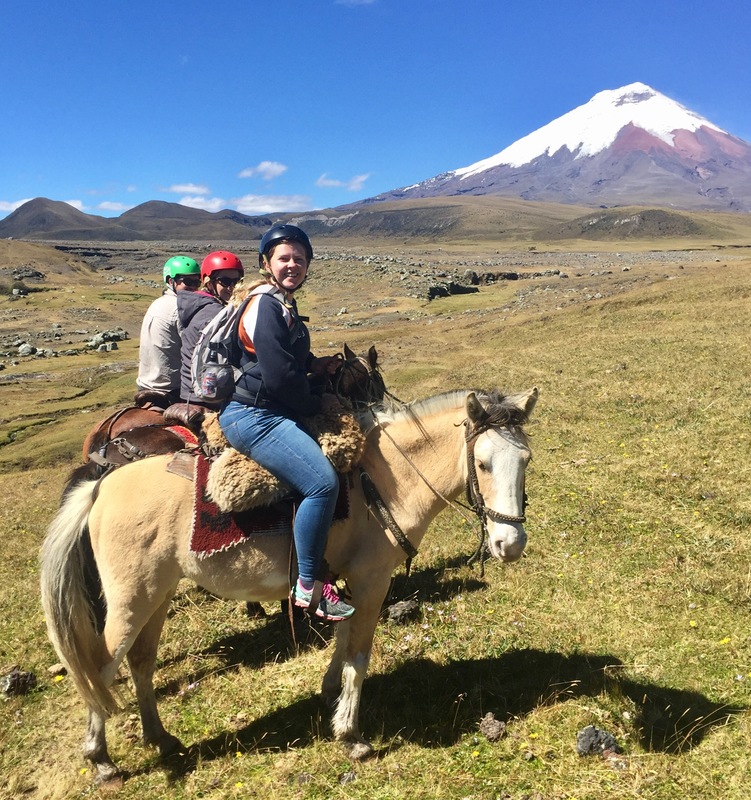 The next day was my last and I decided that hiking would be too much for me so I pushed myself further outside my comfort zone and signed up for horse riding. Anyone who knows me well will know I’m not an animal person. In fact I’m scared of most animals and normally I would never even go past a horse in the field walking my dogs, let alone voluntarily ride one. But I knew that it would be a great experience and I wanted to try something new. I’m so glad I signed up for it. It was amazing. 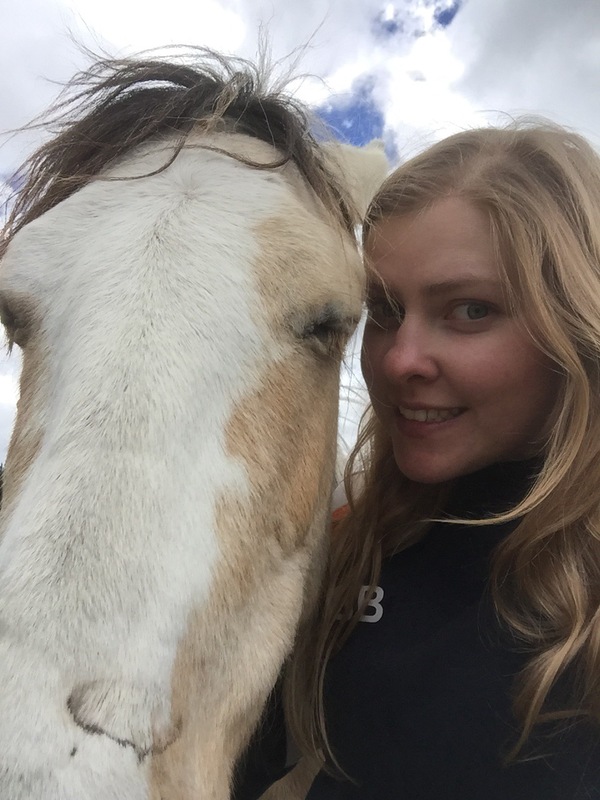 My horse, Mil Amores, was a beautiful blonde steed and he could sense I was inexperienced and nervous. 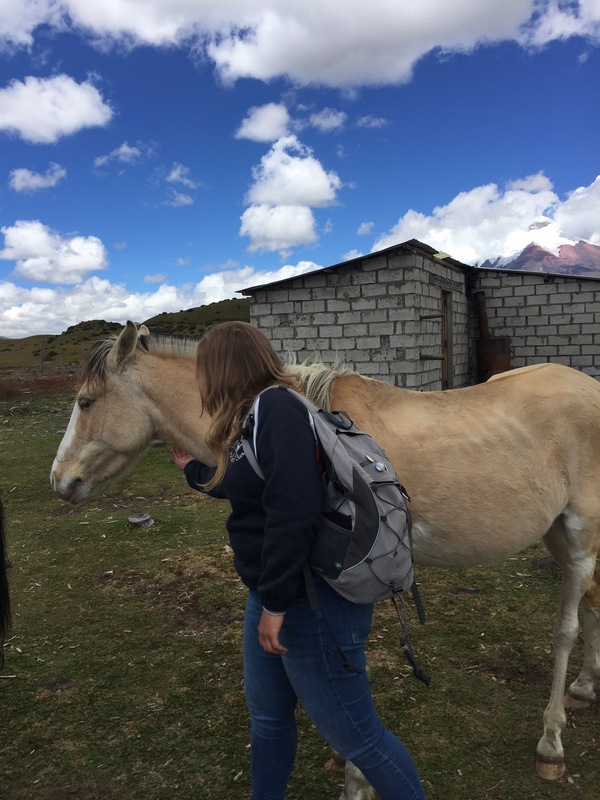 We slowly trotted along most of the way until break time, getting closer and closer to Cotopaxi. On the way back we went quite a bit faster and my legs and bottom found this less comfortable, bouncing and flying all over the place. The riding lasted about three hours but it was over before I knew it. Just like my time at Cotopaxi. And like fate, the clouds covered back over the awesome volcano as I loaded my bags back onto the Jeep. It was a fantastic three days and I was sad to leave. 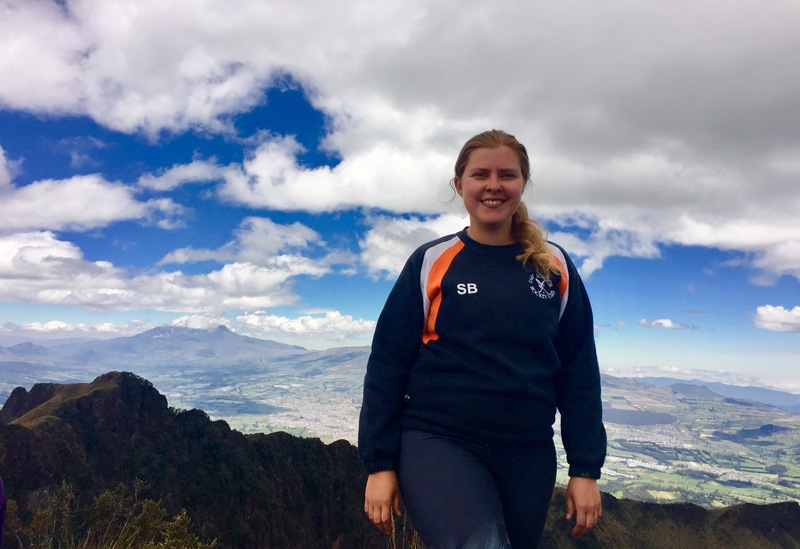 But the sadness didn’t last long as I had the adventure of jumping on my bus to Baños with all my bags while it was still moving – standard practise here in South America but exciting still.